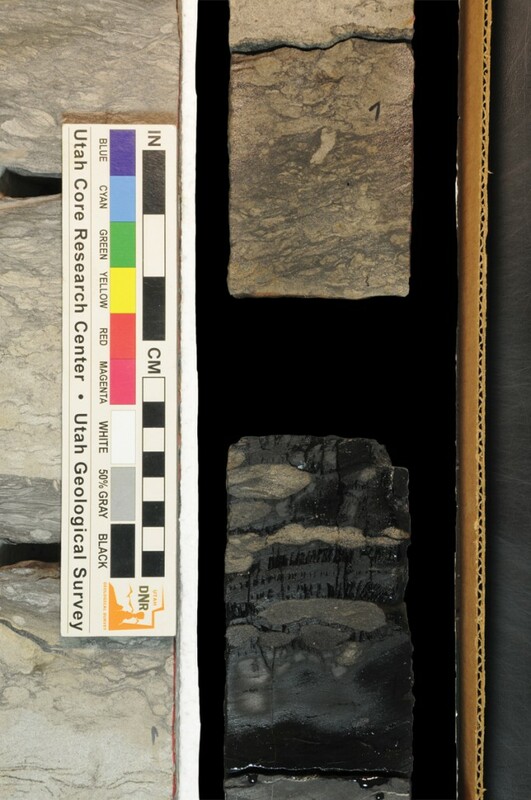 Late Cretaceous paleogeography in Utah. After UGS Public Information Series 54 (1998). Take a drive about 70 miles south of Price through the arid Castle Valley in east-central Utah. Then imagine you are on a huge river delta with swamps and marshes of lush vegetation similar to the Mississippi Delta. Silt- and sand-laden streams and rivers meander through the area flowing east to a nearby sea that stretches east as far as Kansas. To the west lies a towering, north-south-trending mountain range (the Sevier orogenic belt)—the source for the sediments that the river system used to form the delta you are on. Dinosaurs are roaming around and reptiles fly in the sky. This is what east-central Utah looked like around 94 to 86 million years ago during the Late Cretaceous Epoch. This ancient delta’s streams and rivers deposited their loads of sand and silt as point bars, levees, and channel fills where the rivers met the sea or along beaches, barrier islands, and in tidal inlets. Mud accumulated in bays, lagoons, and farther offshore, whereas vegetation in swamps piled up to form peat bogs. Eventually, the sea retreated and environmental conditions changed. 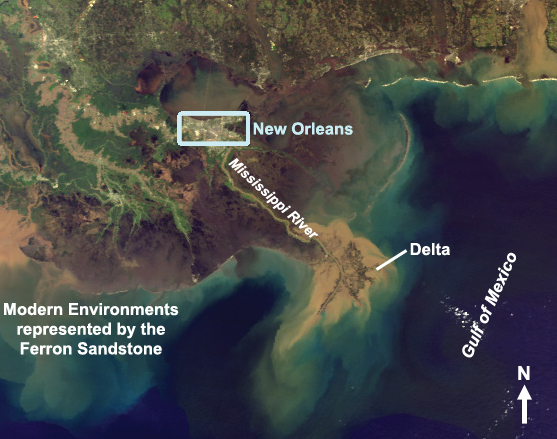 The delta was buried by over 8000 feet of sedimentary rocks. Then regional uplift began about 70 million years ago exposing these rocks to the forces of erosion. Rapid erosion of the Colorado Plateau by the Colorado River and its tributaries over the last 5 million years and continued uplift have, once again, revealed the ancient river delta, which is now beautifully displayed along the west flank of the San Rafael Swell in the rocks known as the Ferron Sandstone—one of the most extensively studied cliffy exposures of rock in Utah. Why is the Ferron so important to geologists? It shows, spectacularly, vertical and lateral changes (the exposed rock belt extends northeast-southwest for over 80 miles) in the deltaic deposits, which serve as a visual analog for similar rocks that produce nearly half the world’s oil and gas hidden deep below the surface. Examples are found in the U.S. Gulf Coast, Alaska, North Sea, and Utah’s own Uinta Basin fields. The earliest Ferron Sandstone study goes back to 1874, to investigate coal resources in the area. Well over one hundred years and many studies later, the UGS conducted its own major investigation of the Ferron in the 1990s. 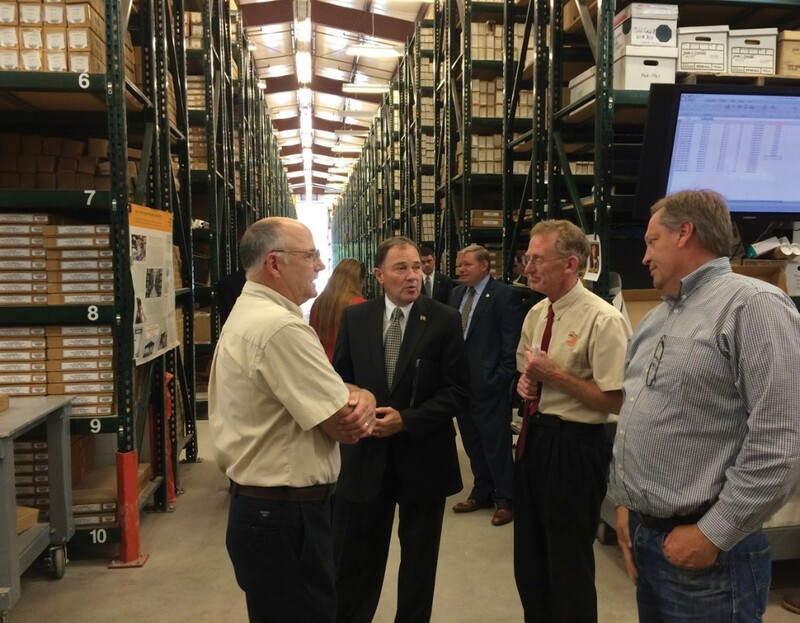 The project involved two oil companies, three local universities (professors and students from the University of Utah, Brigham Young University, and Utah State University), and several consulting geologists. The goals of the project were to provide petroleum companies better tools and models to apply to their own oil and gas fields, as well as exploration efforts, using the Ferron rock exposures as examples. A major question, however, was what did the Ferron look like in the subsurface beyond the outcrop cliff face—a critical factor in predicting changes in the rocks in three dimensions. To answer that question, the UGS drilled four core holes and acquired, through donation, five more rock cores collected from shallow wells immediately west of the outcrop belt. 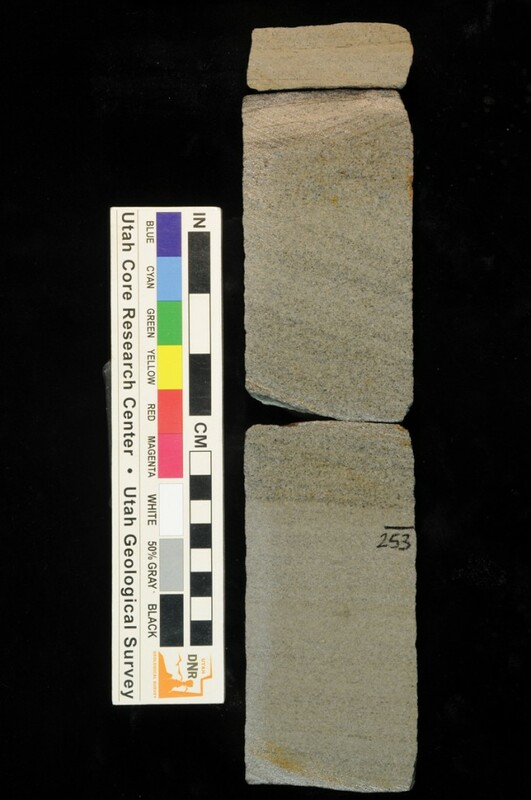 These rock cores proved invaluable to the study, which resulted in over fifteen scientific publications. 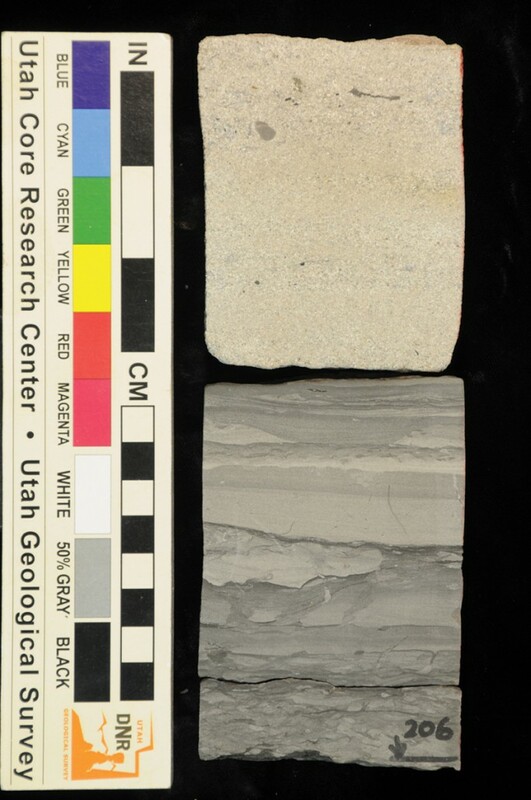 The UGS collection of Ferron Sandstone cores stored at the UCRC continues to be invaluable as training materials for students and industry professionals. After the cores were drilled, they were slabbed (cut in half) to remarkably reveal the various rock types and depositional environments seen in the Ferron outcrops—sandstone beds, representing river channels, sand bars, and beaches; siltstone and shale containing shells and burrows of marine and brackish water organisms that lived offshore or in bays; and coalbeds that formed from vegetation in swamps and peat bogs. The cores also show rock boundaries indicating times with major changes in sea level, critical information when developing oil and gas fields or exploring for new ones. The cores also provide information about oil and gas reservoir quality (pores in the rocks capable of storing hydrocarbons and permeability— the connection between those pores that permits fluids to flow within the rock to a wellbore). Such descriptive reservoir characteristics can be applied to oil and gas exploration and development of similar ancient delta deposits throughout the world. The UGS annually hosts or conducts numerous workshops (and companion field trips) using the Ferron cores for educational and industry training. 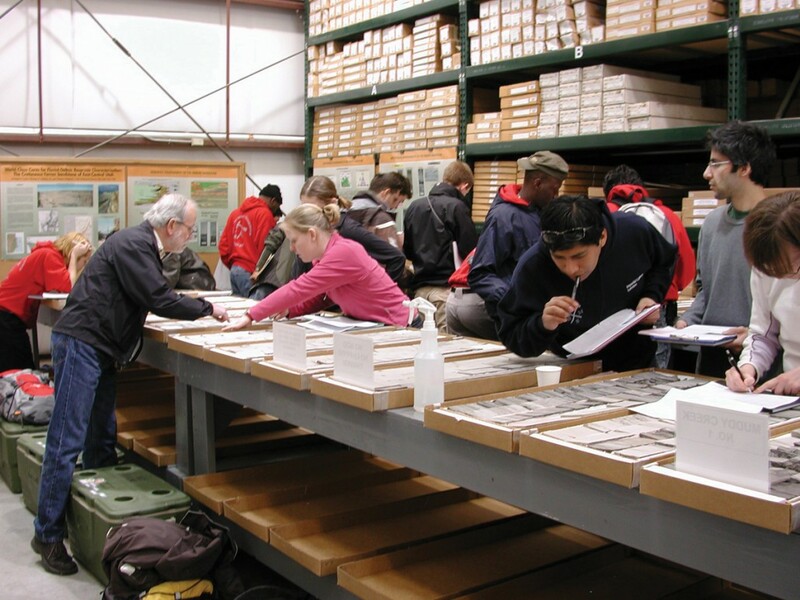 Local universities regularly bring their geology students to the UCRC for Ferron core classes. Attendees of UGS-sponsored and industry training groups have come from all over the U.S., as well as Great Britain, Norway, Ireland, France, Argentina, China, and Indonesia, and researchers continue to use the Ferron cores for new studies. Someone once said, “Oil is not found in the ground, it is found in the minds of geologists!” Geologists, both students and professionals, use their minds to better understand the geologic past and imagine where to find oil and gas, employing tools such as the UGS core set and rock exposures of the Ferron Sandstone.